I recently found out that America didn't have some items which we had in New Zealand (the Star Wars Slingers toys), so I thought I'd better start posting new "finds" down here. Clone Trooper and General Grievous Electronic Helmets - these are more facemasks than actual helmets (unlike the older Boba Fett and Darth Vader helmets, these new ones have no back and use straps). Empire Stirkes Back Imperial Forces: Bossk, IG-88, and Snowtrooper. Phew! Try writing that lot down on a scrap of paper and nothing to lean on. The latest items to arrive in stores down here in New Zealand are the Robot Chicken Star Wars III DVD and Blu-ray, 3 3/4" scale Y-wing, and the (as usual over-priced) Lego Star Wars Darth Vader Mini Fig keyring LED light. Next week of course is the arrival of the Star Wars Blu-ray sets. The new Playskool Star Wars Jedi Force Vehicles (Glactic Heroes replacement series) have reached some stores here in New Zealand. The smaller Barc Speeder Bike with Anakin Skywalker, Freeco Bike with Obi-Wan Kenobi, and Landspeeder with Luke Skywalker are priced at about US$20.50 each. The bigger Millennium Falcon playset is about US$65.55. I'm not sure I like these figures as much as the Galactic Heroes. The first few Playskool Jedi Force figure 2-packs have now reached stores down here, along with more of the Speeders and Falcon playsets from above. No sign of new Star Wars Beanz or the Star Wars Gomu Erasers though. Today I saw some bigger Playskool Jedi Force: Anakin Skywalker's Jedi Starfighter (with Anakin and R2-D2) and Snowspeeder (with Luke Skywalker and Han Solo). I think this series, as usual, is going to be too expensive to collect and I don't think they'll sell that well ... there's still quite a few Galactic Heros 2-packs sitting around on pegs. I can see how these toys are more "play-able" for kids....but now they blend in with all the batman, dinosaur, sky aces, transformers, rescue heroes toys. I don't predict this line to last long. I do have my eye on the Lanspeeder though..it's kinda nifty. No Star Wars themed food promotions down here yet - maybe when it gets closer to the Episode I 3D release, but I wouldn't hold your breath. I haven't seen anything advertised for Tintin either. Still no sign of any new Star Wars Beanz nor Gomu erasers yet either. One chain of stores also has lots of the Vintage Tauntaun and Luke's Landspeeder at half price and lots of the Star Wars Beanz Collectors' Tins (Darth Vader and Millennium Falcon) at 30% off. Nice. I haven't seen some of those here yet....although many of the retailers are sticking to the street date of 1/30....whether it is still in effect or not. Rats! I didn't realise they had that official release date ... I should have bought them all last week and sold them on eBay at twice the price as "rare" / "unreleased". 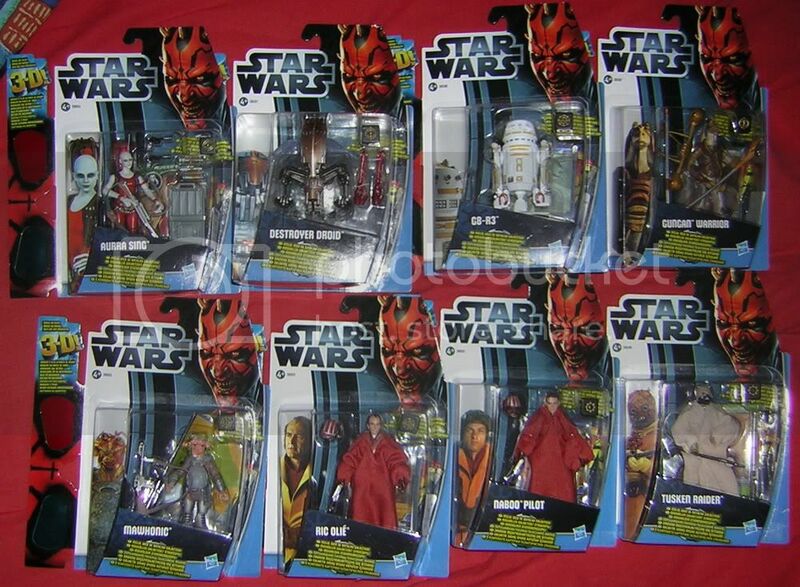 Someone on the Star Wars New Zealand Forum has reported finding the Wal-mart exclusive "Discover The Force" figures (tri-lingual packaging with 3D glasses) at one chain of stores here in New Zealand: Aurra Sing, Darth Maul, Destroyer Droid, G8-R3, Gungan Warrior, Mawhonic, Obi-Wan Kenobi, Qui-Gon Jinn, Ric Olié, Naboo Pilot, Tusken Raider, Yoda. Normally we get English-only packaging here, so these are obiously imports from America - either directly by the chain or more likely by Hasbro New Zealand. Interesting. I wonder where their intended target market is. With the exception of Mighty Beanz, US Star Wars products almost never have tri-lingual packaging. Perhaps Canada? I know there stuff is bi-lingual. Maybe Hasbro decided to make theirs tri-lingual to save on mulitple packaging. Here's the photo the Star Wars New Zealand member posted of their purchases, but it's not good enough to see what the languages are. It looks like Hasbro NZ are piling on the toy releases for the Episode I cinema release in just over a week's time - maybe other distributors will get the new Mighty Beanz, Gomu Erases and new Squeeze Meez into stores too. I discovered three new Star Wars Transformers (small, die-cast) and about eight new, and over-priced, Lego Star Wars sets in today's visit to the shops, plus the new "expanded" Episode I Visual Dictionary from Dorling Kindersley. I also had a look at the new 3D figures. They don't have "tri-lingual packaging" at all ... there's actually 18(!!) different languages on printed the packaging in total. The front of the packs has 13 languages, but some of the wording on the back also has another five languages. The languages are marked with the small international letter combinations in an oval. I'm not sure what some of the languages are though. These figures come with a pair of cardboard 3D glasses and the character picture on the back is printed in 3D. Very cool Buzz. I don't think I've ever seen any packaging in previous years with that many languages. The "pods" (the small rubber figures) are small, but quite well sculpted. Unfortunately the pods are definitely randomly packed, plus the 12 and 8 packs both have "hidden" pods, and the 2-pack bag is blind sealed. It would be an expensive exercise to collect them all and you'll end up with LOTS of double-ups. The Star Wars Slingers have hit the bargain bins with the Slingers device now priced at US$12.51 and the Slingers Medallions blister packs now priced at US$2.50. Also in the bargain bins are the Star Wars Beanz Darth Vader and Millennium Falcon Collector's Tins - not sure on the price of thses, but I think they're US$12.51 each. The new Deleted Scene 3 3/4" figures have started turning up in some New Zealand stores, but only in low numbers so far (one or two per store). I've snagged the 16-pack with the Snowspeeder and AT-AT...waiting on some sales/spare cash to starting picking off the rest of my needs list. I'm debating using ebay to get some of the vehicles/exclusives loose....will have to see what is cheapest.